Expedia has some fantastic Koh Phangan package deals Combining your bookings is a surefire way to save cash and time — and get your adventure off to a great start. Savvy vacationers who secure a package deal on Expedia will save up to 40,450 YEN*. With more than 400 partner airlines and 321,000 properties to mix and match from on our extensive database, you won't have any trouble planning your dream vacation. Need more time to decide? You won't pay us a cancellation fee if you change almost any reservation. We have all the red hot sightseeing tips for your next trip to Koh Phangan. Grab your travel organizer and get ready to start working on that itinerary. Haad Rin Nai Beach and Ban Chalok Beach are among the most beloved attractions here. Plan an outing around them and learn what all the talk is about! Sometimes soothing, sometimes forceful — there are few spectacles as inspiring as a waterfall. Secure yourself a good vantage point and watch Tharn Sadet Waterfall surge, splash and swirl over the edge. There's a wonderful range of things to do in this destination. A day at the seaside is a great way to keep the children out of mischief. Take a couple of buckets to Ban Thai Beach and see who can find the most interesting shells. Still have time to spare? There's something spellbinding about watching water tumbling over a cliff. Try to get as close as possible to Phaeng Waterfall and feel the cool spray hit your skin. 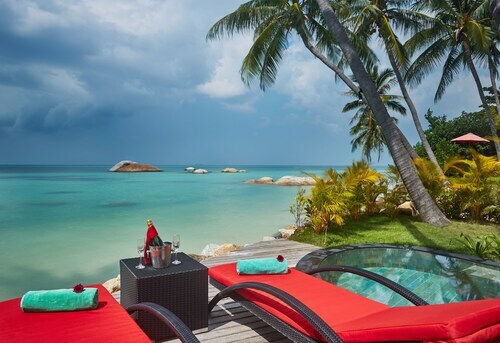 A vacation is a wonderful time to relax and unwind. It's also the ideal time to try new things! Got some time up your sleeve? Head to our Koh Phangan things to do page for a full range of options. Expect a huge variety of accommodations when you head to Koh Phangan. With no less than 231 properties available, it won't be too hard booking a nice place for your cheap vacation or luxury getaway. 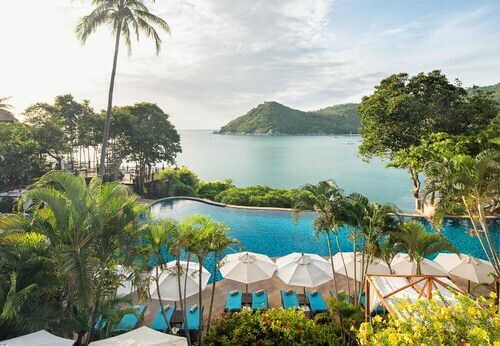 Enjoy some down time at the Anantara Rasananda Koh Phangan Villas (5/5 Moo 5, Thong nai Pan Noi Beach) or the Santhiya Koh Phangan Resort & Spa (22/7 Moo 5 Bantai), a couple of the more upscale properties that can be found on the island. At the lower-budget end of the hotel range are the Colorful Hut (1 M.1,T.Koh Phangan) and the Phangan Pearl Hostel (110/2 M.6, Haad Rin). Getting ready for your trip to Koh Phangan? Wondering where you'll be landing? Ko Samui Airport (USM) is the most convenient option. Once you've disembarked and wandered out of the gate, you'll be 13 miles (21 km) from all the action. 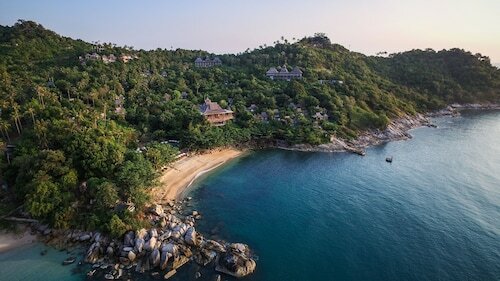 On Thong Nai Pan Noi Bay, this beachfront resort spans 18 acres of tropical landscapes. Within driving distance are Tong Sala Pier, Haad Rin, and Tesco Lotus. Koh Samui is a 30-minute boat ride away. With direct access to the beach, this Koh Phangan resort is within 3 mi (5 km) of Thong Nai Pan Noi Beach, Thong Nai Pan Yai Beach, and Bottle Beach. Haad Than Sadet Beach and Tharn Sadet Waterfall are also within 6 mi (10 km). Nestled on the beach, this Koh Phangan resort is within 3 mi (5 km) of Thong Nai Pan Noi Beach, Thong Nai Pan Yai Beach, and Bottle Beach. Haad Than Sadet Beach and Tharn Sadet Waterfall are also within 6 mi (10 km). 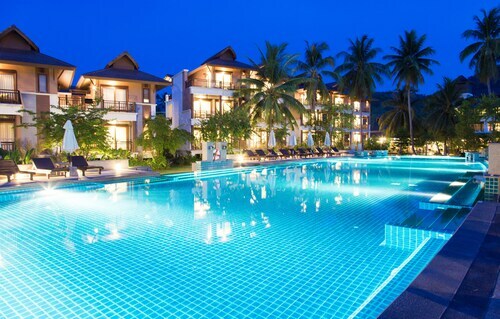 Situated in Koh Phangan, this hotel is steps from Haad Yuan Beach and Haad Rin Nok Beach. Haad Rin Nai Beach and Haad Rin Pier are also within 1 mi (2 km). 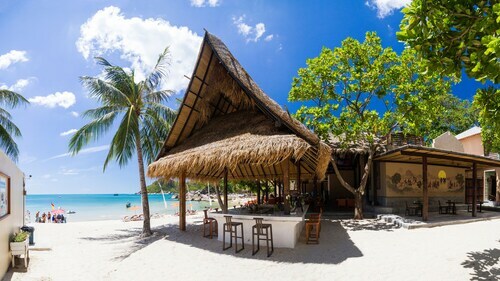 Nestled on the beach, this Koh Phangan resort is within a 15-minute walk of Haad Rin Nai Beach and Haad Rin Nok Beach. Haad Yuan Beach is 0.7 mi (1.1 km) away. Nestled on the beach, this Koh Phangan resort is within a 10-minute walk of Ao Plaay Laem Beach, Wok Tum Beach, and Nai Wok Beach. Hin Kong Beach and Thong Sala Pier are also within 2 mi (3 km). 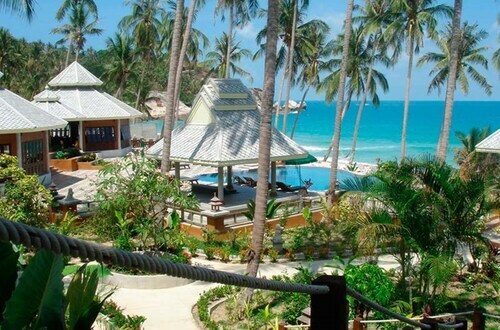 Nestled on the beach, this Koh Phangan resort is within a 5-minute walk of Mae Haad Beach and Koh Ma. Salad Beach is 2 mi (3.3 km) away. Located in Koh Phangan, this beachfront resort is in a provincial park and within 1 mi (2 km) of Thong Nai Pan Noi Beach and Thong Nai Pan Yai Beach. Bottle Beach and Tharn Sadet Waterfall are also within 6 mi (10 km).